In 1962 a group of 11 producers, representing the principal vine-growers’ cooperatives and the major sparkling wine producing companies, founded the “Consorzio di Tutela del Prosecco di Conegliano Valdobbiadene“ (literally, Consortium for the Protection of Prosecco from Conegliano Valdobbiadene), proposing a set of production regulations to safeguard the quality and image of the wine they made. 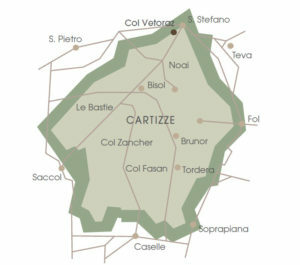 Seven years later, on 2nd April 1969, their efforts were rewarded with recognition by the Italian Ministry of Agriculture of Conegliano Valdobbiadene as the only DOC zone for the production of Prosecco and of Superiore di Cartizze. Today the Consortium groups together almost all of the producers in the area and its task of protecting the Denomination has become increasingly important; indeed, it was decisive for obtaining the DOCG for ConeglianoValdobbiadene, which took place in August 2010.